Whether you know it or not, you are part of a movement, the local foods movement. There has been a trend growing over the last decade or so for folks to get their food locally. The whole idea is that people source what they eat from a local farm, and, in return, they receive food which is fresh, get to know their grower, and support their local economy to boot. People have figured out that shipping substandard food covered in fungicides half way around the world doesn’t make a heck of a lot of sense. I call it a movement because it really is a strong trend you’ll find across the whole country; it’s not just something you find amongst only crunchy folks in California…you’ll find the same thing in Des Moines. Not too long ago very few farmers markets existed, and those that did were not what we think of them today. Go to the St. Paul Farmers Market today and you’d never guess that twenty years ago it looked pretty sparse with a dozen or so vendor huddled in a barren parking lot. 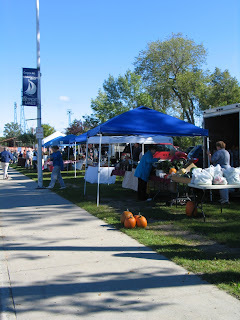 The market we sell at on Saturdays, Lakes Area Farmers Market in Detroit Lakes, didn’t even exist 10 years ago. The very first CSA started in upstate New York in just the early 80’s. By 1990, only a handful existed, until today when we have between 30-50 in Minnesota alone. Things have progressed to the point where a recent Star Tribune headline read “Too Many Markets or Too Few Farmers?” It described a new farmers market in Bloomington and their challenges getting vendors to fill the stalls. Basically no farmers, no farmers market—pretty simple. This being my sixth produce season and second year as our market’s president, I know what this is all about. Local foods used to be on the fringe, like organic foods in the 1970’s. Now it’s definitely taken hold and things have grown to the point where we have no problem finding customers, but a harder and harder time finding growers. And this will be problem for the near future until guys like myself quit their dayjobs and grow full-time, convention farmers get into produce, or more people are convinced to give up their weekends. Broccoli: A later variety than we had a couple of weeks ago. A couple Summer Squash: You may already be getting sick of this stuff, so I took it down to two this week. Lacinato Kale: A Italian variety of kale which most call “Dino Kale” since it looks like it comes from prehistoric times. Chiogga Beets : An heirloom variety. See recipe below. 2 T chopped parsley, tarragon, dill, or other herb. Grate beets into coarse shreds. Melt the butter into a skillet, add the beets, and toss with ½ teaspoon salt and pepper to taste. Add ¼ cup water, then cover the pan and cook over medium heat until the beets are tender. Remover the lid and raise the heat to boil off any excess water. Taste for salt, season with a little lemon juice or vinegar—balsamic or red wine is good—and toss with the herb. If you don’t mind the shocking color, you can stir in a tablespoon of yogurt or sour cream, always a good addition to beets. A couple weeks ago I went to a neighbor’s 50th wedding anniversary, and, naturally, everybody wanted to know how the big garden was growing. Usually when we begin talking about growing things (whether we’re talking soybeans or heirloom tomatoes), we typically end up talking about problems. There are so many things which can kill off a crop: hail, drought, fungus, countless viruses, dozens of insect varieties (striped cucumber beetle, squash bugs, Colorado potato beetle, aphids to name a few), but I would argue a child is the greatest danger to any plant. Our 2 year old Sylvia makes it her job to “help” us when we’re out working the fields. She pulls flowers when we pick flowers, she rips out potato plants when we pull out ragweed…I think you get the picture. She is our little Godzilla, but instead on stomping on Japanese people, she has a tendency to crush plants and vegetables. High season is approaching now. We are getting cukes in, corn is tasseling, and tomato plants have nice green fruit. Another sign is that flowers are coming in as you see from your cut flower delivery. We’re experimenting with delivery by mason jars, so be careful…I don’t want you to have glass all over your garage. We initially thought plastic tonic and club soda bottles would work, but they keep falling over, so we went with something more stable. We will try to put them in secure spots where they won’t fall over. We actually could use some more jars. If you are looking to get rid of some which have been sitting in your basement for a decade or so, we’ll take them off you hands. Please leave by last weeks box if you’d like to help out. Raspberries: A pint or a half-pint, depending on what you got last week. 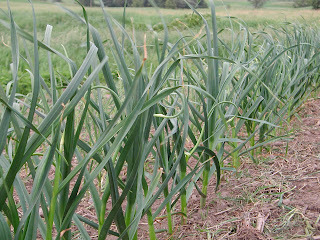 Spring Onions: These are an Italian heirloom variety…most call them torpedo onions. They are mild like any red onion. Mix of Summer Squash : You will see 3 of the 4 types we grow: Yellow Zucchini, Green Zucchini, Sunburst Pattypan Squash, or Yellow Straightneck Squash. Salad Mix: This is a first for us. It’s looking really good. I planted it to give folks some lettuce in the heat of the summer…heads of lettuce don’t survive the heat. Potatoes : Norland reds…your standard early red. I grew up in the Red River Valley and this is the standard. Gold Beets: Use like you would any beet. I put in different varieties just to change it up. This is a pretty loose recipe, so please experiment with seasonings and ingredients (I have added tomatoes in the past and made with thyme instead of basil/oregano). In a single bowl, mix eggs, squash, and seasonings. Heat oil in a skillet and fry like you would an omlette until the fritter is firm (cooked through) and lightly brown on each side. You can make one big fritter or a few small ones…it’s your call. Yesterday I was thinking about heat. This season was short on it in May and early June, had plenty in late June, and is slated to have a good heat wave this weekend. When it comes to growing produce, it’s both good and bad. Since there’s such a diversity of crops out there, I sometimes pray for some warmth to push the plants along; other times I curse it. A lot of it relates to the three main growing seasons on a produce farm: early, high, and late. The vegetables of each season have differing needs and react differently to the heat. Early season crops include early greens, brassicas (the family of cabbage, kohlrabi, kale, broccoli) and lettuce. Too much heat makes these guys temperamental. Lettuce wilts and burns, broccoli kernels get loose, and greens bolt like crazy. One day I see I beautiful row of radishes, and, the next, I see a row of yellow flowers about three feet high—it keeps the bees employed. This heat, of course, has a real impact on what you see in your box. There were two Asian greens, tatsoi and mizuna, which never made the first box. There is also the real possibility that those lettuce heads may not withstand another week (last year’s weather was a lot more supportive…we had 4 weeks of lettuce). This is why I’m putting an excessive THREE heads in the box. They have a better chance of survival in a plastic bag in your refrigerator than out in the field. High season crops include tomatoes, peppers, potatoes, corn, melons, summer squash, and onions. These guys love heat! I can’t even keep up on trellising the tomatoes because they are growing by leaps and bounds. So, when I’m all on edge working around all those stressed out broccoli plants, I just have to make a short walk to admire all those pretty tomato plants sprouting thousands of yellow flowers. It’s a pretty sight. Like early season, we have a “compressed” late season. We basically squeeze both in just before and immediately after our most productive season in Minnesota, snow season. Late season crops include winter squash, pumpkins, late brassicas, and root crops. What these guys need more than anything is time and the heat sure helps push them along the way. Late brassicas and root crops like turnips and rutabagas haven’t even been planted yet, so stay tuned. These runts are the end of the line. I neglected to say last week that they are snap peas where the pod is edible. If you shelled, you probably didn’t get a lot a pea. Many just peel, slice, and eat, but there are recipes where you cook them like stuffed kohlrabi. This is another one of those vegetables with two names. See recipe below. With a cleaver or sharp knife, trim the top leaves of the cabbage and the root ends. Separate the stalks and wash them under cold running water. Cut each stalk, leaves, and all, into 1 x 1 1/2 inch pieces. In a small bowl: combine the sugar, vinegar, soy sauce, salt, and cayenne pepper and mix thoroughly. Leave the oil within easy reach. Heat a 12 inch wok right after washing over high heat. When the last drop of water has been evaporated, pour in the oil, swirl it about in the pan and heat for 30 seconds, then turn the heat down to moderate. Immediately add the cabbage and stir fry for 2-3 minutes. Make sure all the cabbage is coated with the oil. Remove the wok from the heat and stir in the soy sauce, vinegar mixture. Transfer the cabbage to a platter and let it cool to lukewarm before serving. Or, if you prefer, serve it chilled. 4 servings.